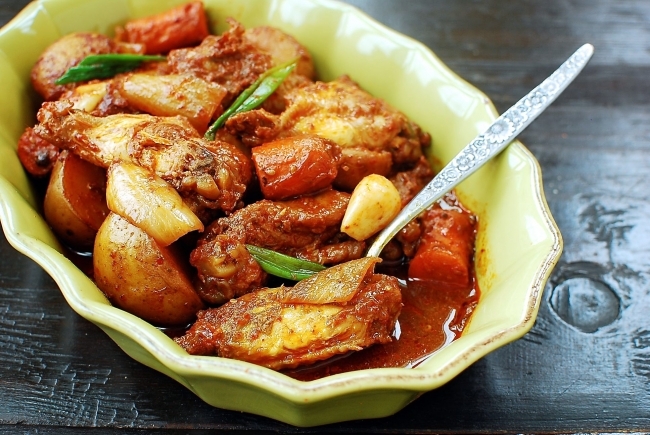 Dakdoritang (or dakbokkeumtang) is a chicken dish that’s cooked in a spicy red sauce along with vegetables such as potatoes, carrots, and onions. 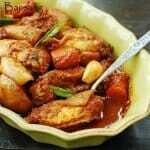 This recipe uses a combination of chicken thighs and wings and shows two ways to cook it – slow cooker and stove top. I love my slow cooker! Once I prepare the ingredients, I can rest my arms and legs while it does the cooking for me. What’s there not to like? If you don’t have a crock pot, you should put it on your holiday gift list. If you have it tucked away deep in the kitchen cabinet or on a shelf, get it out and put it to work during this busy holiday season. Trust me! 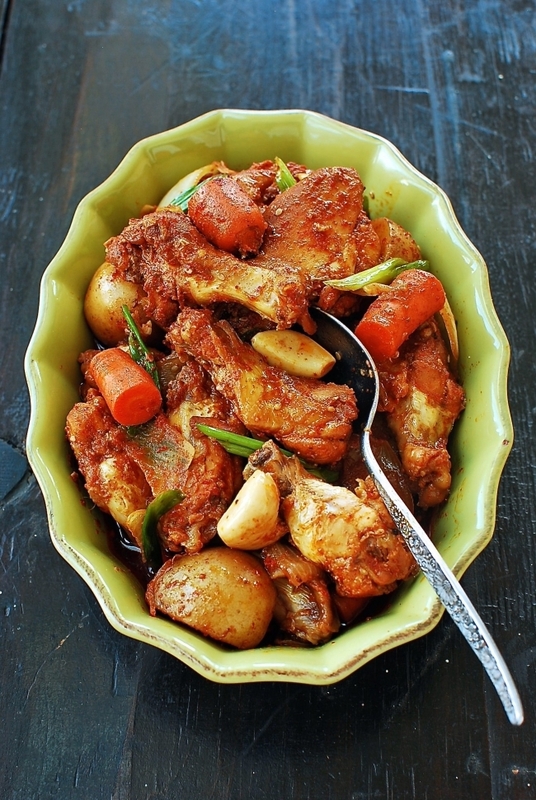 With a good recipe, the slow cooked food turns out tender and flavorful, not mushy and watery. 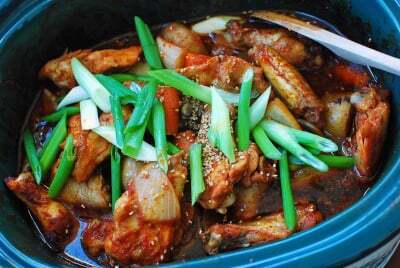 Here, I am showing you how to make a slow cooker version of a classic Korean chicken dish. I’ve also provided the method for stove top cooking. 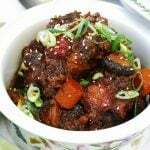 Dakdoritang (닭도리탕) is a chicken dish that’s cooked in a spicy red sauce along with vegetables such as potatoes, carrots, and onions. It’s also called dakbokkeumtang (닭볶음탕) or dakmaeuntang (닭매운탕). It’s usually made by cutting up a whole chicken into small pieces, but here I used a combination of chicken thighs and wings I had in the freezer. To make this dish on the stove, you need to add water because liquids evaporate quickly on the stove. That’s not the case with the slow cooker. The amount of sauce and other ingredients in this recipe yields sufficient liquid for slow cooking, leaving just enough sauce at the end. The result is succulent pieces of chicken packed with spicy and savory flavors! 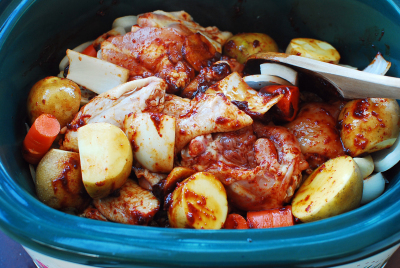 Place the prepared chicken and vegetables (except the scallions) in the slow cooker. Add all the sauce ingredients (except the sesame oil and seeds). Stir well to coat the chicken and vegetables evenly. Turn the slow cooker on high heat. Cover, and cook for about 4 hours. (You can cook on low heat if you’ll be out longer, about 6 hours). Stir in the scallions, sesame oil and sesame seeds. Skim off excess fat before serving, if desired. Serve with a bowl of rice. Stove top method: To make this dish on the stove, add 1-1/2 cups water to a large pot along with the chicken and the sauce (except the sesame oil and sesame seeds). Stir well. Bring it to a boil over high heat. Reduce the heat to medium and cook, covered, for 15 minutes, stirring occasionally. Stir in the vegetables (except the scallions). Cover, and cook for an additional 15 minutes, stirring occasionally. Continue to cook, uncovered this time, until the chicken is tender and the sauce is slightly thickened, about 10 minutes. Stir in the scallions, sesame oil and sesame seeds right before turning off the heat. Who doesn’t like slow cooked stew and yours look so delicious. I am loving your pictures, very tempting and comforting. I just want to reach through and start eating! Great job as always! This looks delicious! Would love to try this too! I love spicy foods. Thanks for the recipe. I want to make this very soon. If we want a non spicy version, do we just omit the spicy sauce? Yes. You might need to add a bit more soy sauce and sugar if you don’t use the chili pepper paste (gochujang)which is a bit salty and sweet. Enjoy! Hello! I have gochujang but none of the Korean red pepper flakes. I do like spicy food — how would you suggest adjusting the measurements, and should I add cayenne or other crushed red pepper flake (as seen in Italian-American dishes or served with pizza) as a substitute? I’m a Canadian living in South Korea. I made this for my wife and friends and they loved it (they’re all Korean). They even asked me to make more. It was so easy and delicious. Thanks for posting this and if you have more recipes for the crock pot please let me know. So happy to hear you all enjoyed it!! Thanks for letting me know. I’ll definitely have more crock pot recipes. Stay tuned! You can, but the taste of the dish would be quite different from this. I’m sure it will still be delicious though. Cheers! Hi, can I replace rice wine with mirin instead? Yes, you can. And, sorry about not posting your comment sooner. Somehow I missed it in my e-mails. Enjoy! 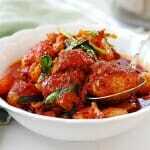 I’ve made this 3 times, twice using chicken fillets (reduced the cooking time) and yesterday using chicken drumsticks. I have to say yesterday’s was the best one. There’s just something about chicken on the bone that makes it seem extra tasty! Really lovely recipe, not much actual work to prepare it, yet the results are fantastic! Aww that’s so nice to hear, except the part your husband didn’t leave much for you. Ha ha! Thank you so much for letting me know how you liked the recipe. Look forward to hearing more from you. I am making this right now. This was so easy and its smelling delicious. Hopefully it’ll taste yummy! Thank you for the recipe. I know what you mean. I love the smell of this being cooked in my slow cooker. Hope you enjoyed the dish! Thanks! That’s so nice to hear! Thanks for letting me and other readers know. Enjoy your dinner! Awesome! Now I’m craving it. I guess I’ll have to make it again soon. Cheers! I’m so happy my friend recommended your blog! I have a question about the chicken- do you use skinless or skin on? Hi Miranda – I’m so happy to meet you here. For dishes like this, I leave skin on. It’s better for flavoring, but you don’t have to eat it if you mind. Thanks for visiting! That’s great! I’m happy to hear you and your wife enjoys it. Mushrooms and broccoli sound good! The more vegetables the better! Thanks for the feedback!! Thank you so much for the delicous recipe! I too love my crockpot and tried this recipe several times. Must say stew comes out perfect each time! Awesome! Thank you very much for letting me know. Cheers! If I am making this on a crock pot, no water is needed? No. Please read the second paragraph of the head note. Thanks for trying my recipe! I have been searching for a crockpot dakdoritang recipe. This looks perfect! I have no rice wine but otherwise I have all the ingredients. Will let you know how it turns out! Thanks! Look forward to hearing back from you. Enjoy! I love using my crock pot. Wish there were more Asian slow cooker recipes out there. Just put all the ingredients + kabocha squash in…can’t wait for the result! No it wouldn’t, but you can also grate the ginger. Enjoy! I hate biting into a chunk of ginger. Would it taste bad if I omit from the recipe? I don’t remember seeing gochujang at the Whole Foods store near me. You can buy from Amazon. It’s an essential Korean ingredient. If you like Korean food, invest a little bit money to use the right ingredient. 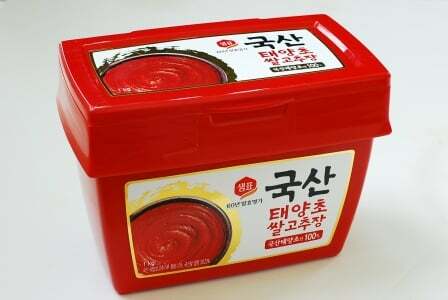 Gochujang lasts long. Thank you so much. I will get from amazon. Every recipe I saw online for this dish instructs to cut the potatoes and carrots in big chunks. Why is that, may I ask? If you cut small, the potatoes and carrots will cook too quickly and disintegrate while the chicken is cooked through. 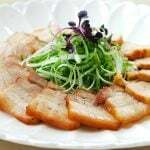 In general, when the main ingredient is cut into large pieces, you should cut the other ingredients into large pieces also. Looks better that way as well. Hope this helps. Thank you, Sook! You have a wonderful blog as well. It works well in a slow cooker. Hope you try it. I gave this a go today and was so happy I did. What a delightful balance of sweet and savoury with a roundness coming from the heat. I’m adding this dish to my list of must eats! Thanks for sharing and I’m so pleased that the internets brought me here. Excellent! I am so happy to hear it turned out well for you. Thanks for letting me know! Cheers! Hi! This sounds so good! Question: how many servings does this yield? I think 3 to 4 servings, depends on the portion size. Thanks! Do you have any particular gojuchang brands that you recommend over others? I feel like I keep picking bad ones! See the ingredient tab above. That’s what I usually use. A bit more expensive than others but it’s worth it. You can try Japanese cooking sake or Korean cheongju or soju, which ever you can find. Thanks for using my recipes! Hi. I was looking for samgyetang recipe and somehow stumbled at your site. And suddenly my hand keep clicking to all your recipe! haha..actually I have a question. Because I’m a muslim, I can’t use alcohol in my cooking. Can I replace the rice wine with apple cider, for example? any suggestion so that the taste will not too deter from the original one? Thanks! 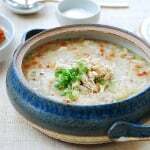 In most cases, you can omit rice wine without significantly compromising the taste of the dish. I’m sure apple cider would work in certain dishes, so experiment it. It’s not, however, a typical substitute for rice wine. Thanks for finding my blog! Look forward to hearing more from you about Korean cooking. This looks good, but one question before I try it. The recipe calls for bone-in chicken parts, cut into small pieces. So how small do you like? I have no problem butchering a chicken. Should I cut one into the typical 8 pieces, then cut each breast in half? Or would you just buy a package of bone-in thighs? Typically, Koreans cut even smaller for this type of dishes, but cutting into 10 pieces will work. Or use precut pieces of your choice. Thanks! Hello! I am so excited I found your blog. I lived in Korea for a 16 months and dakdoritang was one of my absolute favorite dishes. When I used to have it in Korea, there was a lot more liquid or broth. Do you know if there is something I could add to your recipe to make it more soup-like? I’m thinking chicken broth or just more sauce ingredients? Also, this is in my crockpot right now and I can’t wait for work to be over so I can run home and start eating!! Hi Laurie – Thanks for finding my blog! Try to cook over lower heat (medium low) for the last 25 minutes (may take a little longer). It will keep a lot more liquid. Also, the recipe for stove top cooking says to cook uncovered for 10 minutes to thicken (reduce) the sauce. You can cook covered instead. If these changes don’t give you as much liquid, you can add more water (or broth), but you’ll also need to add more sauce ingredients. Hope this helps. Oh i missed your last sentence that you are cooking this is a crock pot. So ignore my advice on stove top cooking and just add more liquid and sauce if the slow cooking didn’t give you enough liquid. Cheers! Hi Hyosun! I just found your blog today, and I made this for my parents for dinner!!! They loved it and were very impressed. Thank you so much for sharing your recipes. 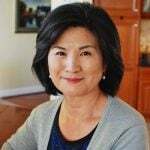 Your blog is beautiful and I’m so inspired to cook more Korean food! I’m Korean American and have never really ventured into that territory, but your recipes make it all so accessible. Thanks again, I will visit frequently! Awesome! I’m so happy to hear you parents loved it. You can do it! Just keep on cooking. Thanks for the nice words! Hi Hyosun, I made this today and it turned out good. Thank you again for all your work. I owe my success to you. I’ve noticed you use corn syrup in some of your recipes… Why? What function does it serve in Korean cooking? In all honesty, I made this last week to so-so reviews. I had made the slow cooker dakjiim prior to that, and got a much more positive reaction. This dakdoritong didn’t have the same complexity or depth of flavor. 1. Longer in the Slow Cooker? I cooked this for 4 hours, as the recipe recommends. The problem was neither the chicken or the potatoes were infused with any of the flavor of the sauce. Only the carrots picked up the flavor, and were absolutely delicious; I’d add more. I wonder if cooking it lower and slower would impart more of the flavor. The sauce, before first adding it to the chicken, was spot on. It’s just getting that into the food. Soy sauce is salty, and this recipe calls for 4 TBSP of it. Still it seemed a little underseasoned; the flavors didn’t pop. Adding 0.5 or 1 tsp to the sauce initially might help. I don’t think you can add enough ginger. Since I had quite a bit of fresh ginger, I peeled two 1-2″ pieces, which I cut into thin discs. I thought this helped to develop more flavor. For many slow cooker recipes, after it finishes cooking and goes to the warm stage, I pour off the liquids into a saucepan to reduce. After initially tasting it, I went this route, boiling off the liquid to maybe 25% of the original volume, thus concentrating the flavors. So while the chicken tasted mainly like chicken, when we poured the thickened sauce over it and the rice, that brought some flavor to the party. Overall it was a good recipe, but much less flavorful than expected. I believe that could be fixed with just a few tweaks and modifications. That or I was using sub-par gochugaru and gochujang, which I picked up from our local Korean grocery. Angus – All good suggestions. I had an optional step for reducing the sauce for my slow cooker dakjjim recipe, but I guess I should add here as well. 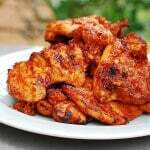 You can also marinate the chicken in the sauce for a few hours or overnight. Thanks for your kind response. This recipe wasn’t there, but just within reach for me. Marinating the chicken overnight is a great idea. When I initially made the sauce it was delicious; I just need to get more of that into the end result. On a side note, reading some of the other comments, the gochujang is a key ingredient – I don’t think there’s any real substitute for it in the dish. Would it be crazy though to leave out the gochugaru, just adding 4 TBSP of the gochujang? I really think that provided more of the spice and flavor. I don’t want to commit great sacrilege if that’s what leaving gochugaru out would mean. Could I make this with chicken wings? Of course! I used a combination of thighs and wings for this post. Enjoy! My new favorite slow cooker dish that I plan on making several more times in the next week. Soooo good. I prepared it before bed and ended up waking up at 3 a.m. and eating half of it. I used boneless skinless chicken thighs and it was perfect, also used 3 tbsp of gochujang as the brand I have is very mild. On a scale of 1 to 10, how spicy is this? hmm I’d say 6. Maybe 7. you can adjust the heat level. Hope you try it. I would love to make this for my son’s bd. Can I substitute the rice wine for something else? You can use white wine or omit it. A tablespoon or two of lemon juice will be great too. Happy birthday to your son and hope he enjoys the dish! Hi Karen – Happy to hear this recipe tastes exactly like your mom’s and you and your husband enjoyed it! Now I need to make this soon. It’s been a while! I have been browsing through your dishes recipes and they sound delicious, the Daegu Tang/Jiri, Haemul Jeongol, Agujjim, Buchujeon/Korean pancakes. mmmmmm. I will try to make the Dakdoritang dish this weekend because I miss Korean food a lot. I know it is not an original Korean dish; but, do you have a recipe for 돈까스? Thank you for browsing through my recipes, William!Yes, I hope to post my donkatsu recipe soon. It’s been in my list of things to do for a while. I made this in the Sun Oven and it turned out great. Left unattended on a partly cloudy day, the temperature averages about 250 degrees F, all afternoon. Thanks for a great recipe! This is my second time using your recipe! Thank you! It’s so delicious and just enough spice. Looks just like how my mom makes it 🙂 so glad to have found your website, many of the dishes I remember from my childhood that I can now make at home. Angyanasayo! Yes it’s possible! I think you will need about 20 to 25 minutes at the poultry setting. Enjoy! Hi there, if you cook it in an pressure cooker/instantpot, do you have to add liquid like in the stove pot, or just follow the recipe as is for slow cooker? I recently made your slow cooker pork ribs recipe, and my husband loved it so much I thought I would try another. Your instructions suggest cutting the chicken with bones in, but I feel like I will mess that up somehow. Would it be ok to put entire chicken thighs or legs in instead? Oh I just saw another question like this, sorry to bother you! Is it bad if I didn’t remember to save the sesame oil and seeds till the end? not at all. I add those things at the end to maximize the aroma. LOVE your recipes! I made this on the stove top and it was absolutely delicious! I want to try this in the slow cooker, but if I were to double the recipe, would it need more time? Thank you, Sam! I’m afraid doubling the recipe may be a bit too much for the slow cooker, unless you have a very large one. It may work if you do x1.5. It will take a bit longer and stirring about half way through. Hope this helps. Trying this recipe today. For the ginger pieces, can you explain how big the slices are? About an inch. Hope you enjoy it! Cheers! I want to try this but my kids will not eat cooked carrots. Are there other vegetables that work well? They love green beans and broccolli, but I worry that they would not hold up well in the slow cooker. Green beans would probably hold up okay, but you’re right about broccoli unless you just use the stem part. You can simply leave out carrots, and the dish will be fine. Hope this becomes your kids’ favorite! I accidentally stirred in the sesame oil at the beginning. What do I do? I’m sure you found out by now it was okay. Hope you enjoyed the dish! Delicious delicious delicious! Best Dakdoritang I have ever tasted, and now every other dakdoritang out there fails me! Thank you sooooo soooooo much for sharing your recipe! 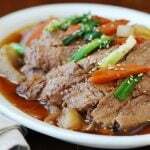 Would love to try your other slow cooker korean dish recipes! Yay! That’s the best thing I heard today! I’m delighted! Thanks for letting me know. Thank you for sharing the recipe. Its smelling so good in here. One hour left remaining, than its time to devour. The smell in the house reminds me of my mother in law’s house. Oma, I am american and been married for 19 years to a korean/american, we have two kids. My husband loves this dish. He has been the only one to make it.. Now he is gonna have a run for his money. ha ha! 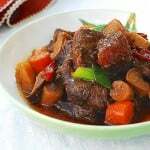 Would love to see more korean style crock pot recipes. From Romania, thank you kindly for the recipe. Hi, I rarely comment but wanted to share with you cuz I’ve been making this recipe for years. Previously I loved the original when I still ate meat, and I was sad to give it up when going vegan because although I’ve seen recipes that veganise this dish, they don’t suggest a protein sub that makes sense to me. But suddenly it occurred to me to try using fresh tofu skin (foo chuk) which I sometimes pan fry first to give it a “crust” 🙂 the tofu skin is able to perfectly absorb the rich sauce so I wanted to let your vegan/vegetarian readers know. That’s great to hear! What a creative way to switch this to vegan. Thanks for sharing the idea and for the nice words! Our family really enjoyed this! Thank you. Love all your meals. Love this dish. Cooked this for one of my favourite cooks. She loved it! Looks terrific; anyone ever frozen it? I’m trying to make some food for my husband while I’m traveling for work. I’m sure it’ll be okay. Can you recommend the settings on Instant Pot for this recipe without using the slow cooker feature so it reduces the time even more?